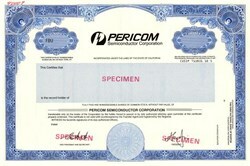 Beautiful engraved specimen certificate from the Pericom Semiconductor Corporation . This historic document was printed by United States Bank Note Company and has an ornate border around it with a vignette of the company logo. This item has the printed signatures of the Company's President and Secretary. Pericom Semiconductor Corporation designs, develops, manufactures, and markets integrated circuits (ICs) and frequency control products (FCPs) used in advanced electronic systems. Its products are used for transferring, routing, and timing of digital and analog signals within and between computer, networking, data communications, and telecommunications systems. The company offers SiliconConnect family products, including PCI and PCI-X bridges, PCI Express Bridges and packet switches, drivers, receivers, and transceivers; low-voltage differential signaling products; SiliconSwitch family products comprising application-specific standard product switches, analog switches, and digital switches; SiliconInterface family products consisting of redrivers/signal conditioners and gates; and SiliconClock family products, such as clock buffers and zero-delay clock drivers, voltage controlled crystal oscillators, clock frequency synthesizers, and programmable clocks. Its FCPs include crystals that resonate at a precise frequency, and crystal oscillators used in various electronic devices. The company's ICs and FCPs are used in various applications, such as notebook computers, servers, network switches and routers, storage area networks, digital TVs, cell phone, global positioning satellite systems, and digital media players. Pericom Semiconductor Corporation markets and distributes its products through a network of independent sales representatives and distributors to end-user customers, original equipment manufacturers, and contract manufacturers in the computer, peripherals, networking, and telecommunications markets worldwide. The company was founded in 1990 and is headquartered in San Jose, California.